The 24 ft. wide hoop greenhouse can cost up to 40% more to build than a 20 ft. wide hoop greenhouse and can result in as much as 40% more to maintain it than a 20 ft. wide. For this reason it is the 20 ft. and 12 ft. wide hoop greenhouses that are the mostly widely used around the world. Unless you must have the extra 4 ft. in width; we strongly recommend you build the 20 ft. wide structures. 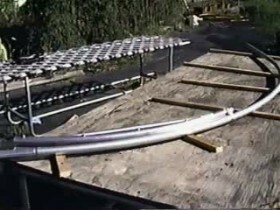 This bending tool produces 24 ft wide Greenhouse Hoops using four-10' 6" lengths of 1 3/8 inch o.d. 16 or 17 gage chain link fence top rail tubing which is sold at all hardware stores. NOTE:Because this package exceeds 60 inches in length a UPS over length handling charge of $15.00 is automatically added.